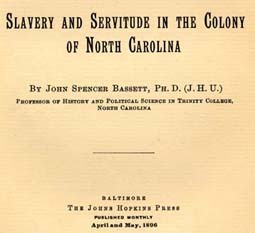 John Spencer Bassett, 1867-1928 Slavery and Servitude in the Colony of North Carolina. Slavery and Servitude in the Colony of North Carolina. Baltimore: The Johns Hopkins Press, 1896. African Americans -- Legal status, laws, etc. -- North Carolina. African Americans -- North Carolina -- History -- 17th century. African Americans -- North Carolina -- History -- 18th century. Indentured servants -- North Carolina. Indian captivities -- North Carolina. Indian slaves -- North Carolina. Slavery -- Law and legislation -- North Carolina. Slavery -- North Carolina -- History -- 17th century. Slavery -- North Carolina -- History -- 18th century. Slaves -- Legal status, laws, etc. -- North Carolina.